Crude Oil Daily: Tullow Oil Ghana awards FMC Technologies US$340 million contract. 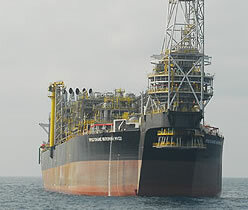 Tullow Oil Ghana awards FMC Technologies US$340 million contract. The US$4.5bn TEN Project, approved in May 2013, is located in the deepwater Tano Contract Area, nearly 30km west of the Tullow Oil-operated Jubilee Field. The field reportedly holds about one billion barrels of oil and Tullow Ghana Limited has estimated that when the project is fully operational, it will produce 80,000 bpd. According to a company statement, US-based FMC Technologies will provide subsea trees, manifolds, tooling and associated control systems and systems integration for this project. The company has been operating in Ghana since 2008 and it recently completed the assembly and testing of subsea trees at its support base in Takoradi. FMC Technologies operates 30 production facilities across 16 countries.